The Marana News was on hand last week to cover the Arbor Day/Groundbreaking Ceremony at the new Honea Heights Pocket Park. 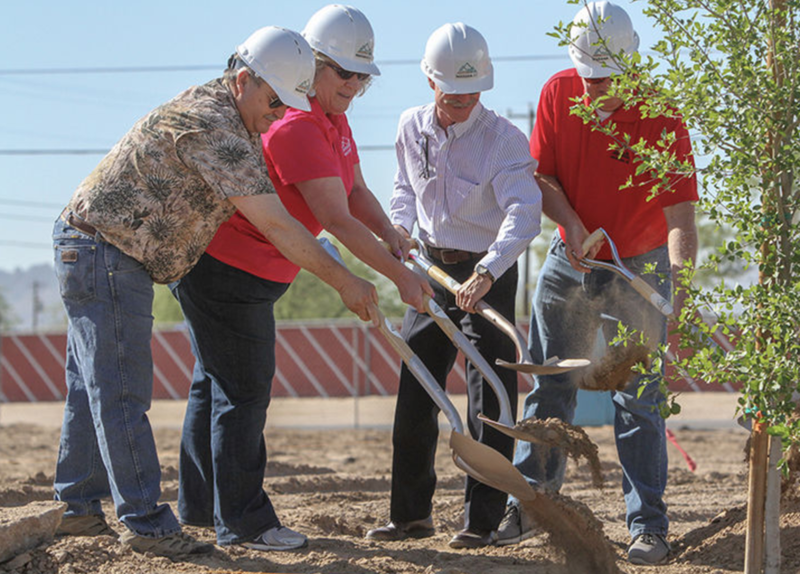 The Town of Marana celebrated Arbor Day last week, and used the opportunity to break ground on a new community park. Gathered in the Honea Heights neighborhood last Friday, April 27 town staff was joined by Mayor Ed Honea and Councilmembers Patti Comerford, Dave Bowen and John Officer to mark the beginning of the neighborhood’s new community pocket park. The celebration also fortified the town’s commitment as a Tree City USA. “What you’re looking at out here is about 33,000 square feet of park, and I think we’ve really brought a lot of great elements into this property,” he said. The site will house a basketball court, open green space with trees and other vegetation, a playground structure with shade and a barbecue/ramada area for gatherings. Grating and other work has already been performed to prepare the location, but last week’s ceremony marked a point at which development starts “going vertical,” as Conroy said. Read the rest of the story in the Marana News.